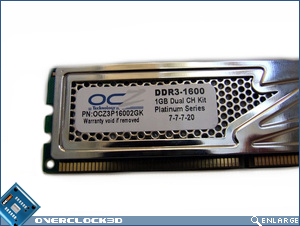 "DDR3 speeds have been ramping up in leaps and bounds over the past few months, and today we get to take a look at OCZ's insanely fast Platinum DDR3-1600 kit." Now, lets sort out all those spelling mistakes.. hahahah got ya, only joking!! None the less DDR3 is finally looking up.. but then you look at the price! Damn thats some smokin hot ram. I won't get ddr3 until the price of 2gb is half that price!